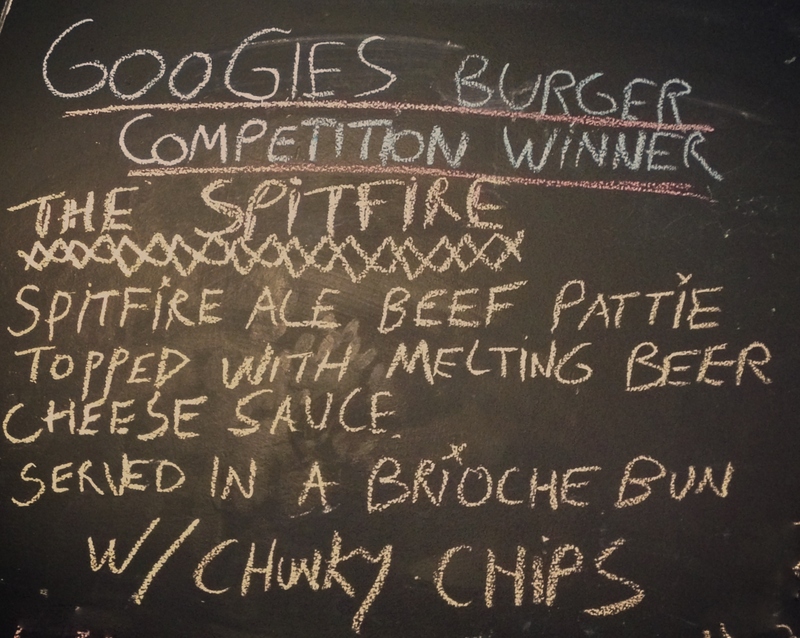 However, that post does not reveal the secrets of my burger concoction – for fear of being gazumped by another competitor, I kept the secret recipe hidden until now! They have altered it slightly by added sugar-cooked bacon and bacon jam – I tried to find the bacon jam to add to the recipe before I entered it, but I wasn’t able to get hold of the Kentish Bacon Jam man in time. I entirely agree with that addition, not sure about the sugar-cooked bacon though – bacon is all well and good, but I think it might be getting to the realms of you can’t taste anything else and the ale is what is supposed to sing here. 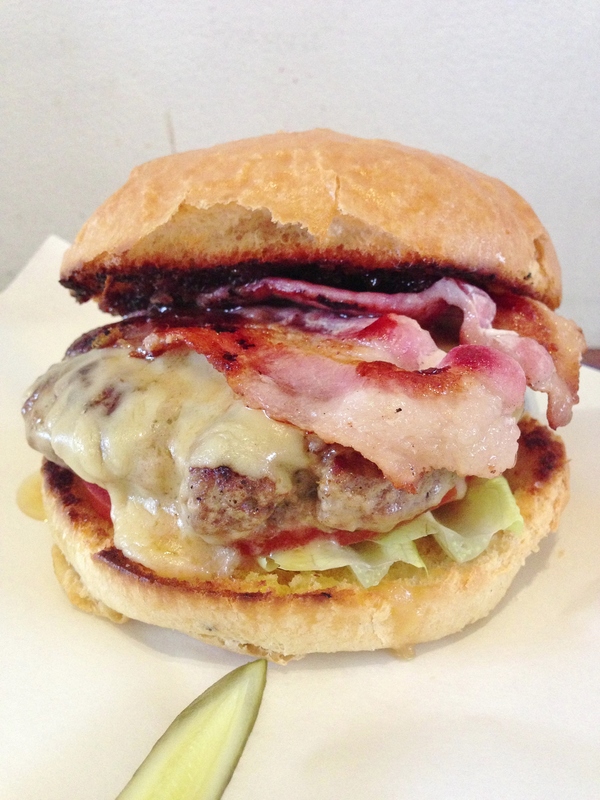 Be prepared for serious drool action and get your sat navs out and head for Folkestone town! 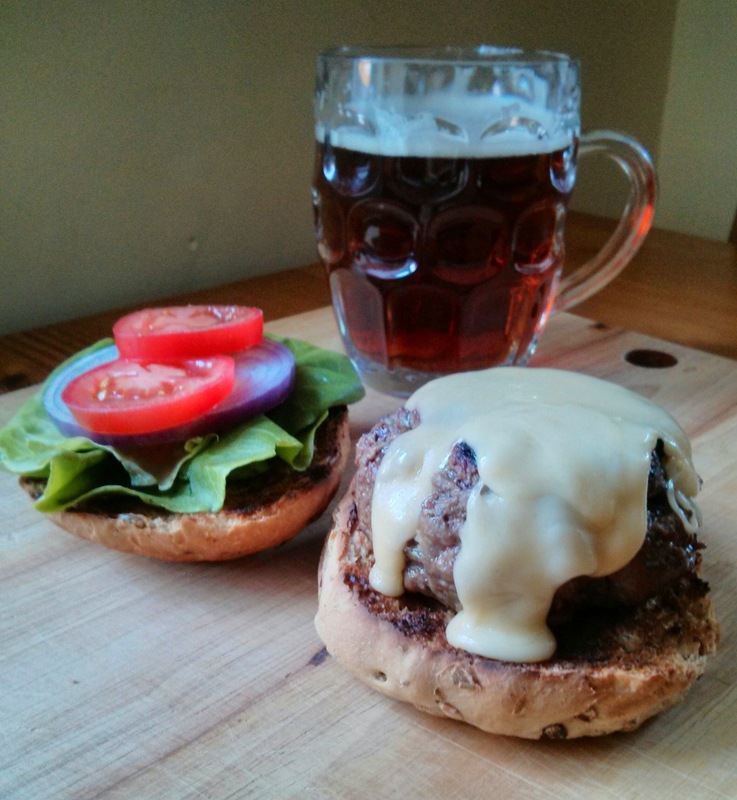 You’ve only got one more week to try out the taste of Kent in a burger: The Spitfire! 1. Mix steak mince with a good amoutn of salt and pepper as well as a dash (1-2 Tbsp, you don’t want it sloppy) of Spitfire. 2. Shape into two patties about 1-1½” thick and refrigerate until needed. 3. When ready to cook, heat a dry frying pan or grill pan over very high heat. 4. Add the burger patties and cook for 5-7 minutes each side, depending on thickness, for medium. 5. While the burgers are cooking, grate the Winterdale Shaw into a nonstick saucepan and heat over a low heat until the cheese begins to melt. 6. Stir in about 1-2 Tbsp of Spitfire, again you don’t want it sloppy, until combined. 7. Add a sprinkling of flour and keep stirring until the cheese starts to bubble and forms a fondue or pourable sauce. Do this right before you’re ready to serve. 8. Let the burgers rest for a minute or two, then place on top of the buns and cover with the sauce. Add any accompaniments (i.e. bacon jam, tomato, lettuce, onion, pickle) and enjoy! Super! Did you ever find out how many entries? If the Ale doesn’t sing with that sugary bacon, you can always recruit Rhys to sing after the merrymaking. You know he loves a song! Ale! Wonderful. This is a damn good burger!